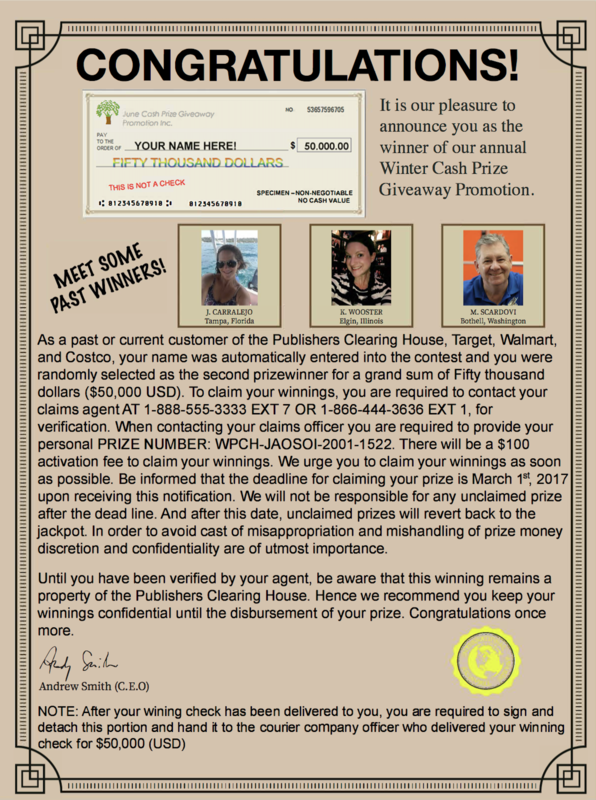 When Vivian Murphy wrote out the check for an $890 processing fee, it seemed like nothing in comparison to the $1.5 million she would get in return from the well-known direct marketing and sweepstakes company Publisher’s Clearinghouse. And even when the sweepstakes spokeswoman, continued asking for more money—$4,000 one time, $10,000 a week later, and, finally, $20,000 (as reported by The Boston Globe)—it never occurred on the 85-year-old that anything was amiss. After all, the mailed materials had the Publisher’s Clearinghouse official logo, and the spokeswoman who ultimately robbed Murphy of roughly $27,000 was so nice to talk to. The $1.5 million never came. But the shame and financial ruin of falling prey to a mass marketing scam (MMS) did. This story is just one of thousands of collected by the FBI and other organizations tasked with reducing the incidence and increasing awareness of MMS—any fraud scheme that uses one or more mass-communication methods such as mail, email, and increasingly, scam robocalls. Over the past three years alone, half a million complaints have been filed about sweepstakes and lottery scams like the one Murphy fell prey to; in 2017, nearly 3,000 individuals were targets, losing approximately $117 million. “My past research has examined how decision-making changes as we age, incorporating cognitive changes as well as motivational shifts that occur across the lifespan. I have been especially interested in applying my research to real life decisions that seniors face such as financial decisions, health-related decision making, and susceptibility to scams,” says Wood. Researchers have begun to identify a link between fraudsters’ use of emotional arousal in advertising and people’s increased likelihood of buying the product advertised. Building on this research, Wood proposes to specifically examine the impacts of emotional arousal and age on a person’s intent to respond to a mass marketing scam. To carry out the study, Wood and coresearcher Pi-Ju (Marian) Liu, assistant professor of psychology at Purdue University, are creating two prototype MMS solicitations: one that is designed to be “cold” (black-and-white ink, businesslike, legal letter) and one designed to be “hot” (colorful ink, emotional words, emphasis on winning such as photos of winners). Each participant in the study will be given either the hot or cold version of the solicitation, and then Wood and her team will record the receiver’s perceptions of its potential benefits and risks. “We hypothesize that older adults as a group will not be more susceptible; however, under conditions of emotional arousal (the “hot” solicitations), we think that they will demonstrate increased susceptibility. We have studied this concept in online surveys, but now plan to bring participants into the lab where we can administer other measures and better control the environment,” Wood explains. In addition to teaching and conducting research in psychology, Wood is currently a geriatric neuroscientist with Adult Protective Services in San Bernardino; a member of the L.A. SCAMS Working Group on Mass Marketing Fraud; a consultant neuropsychologist on elder mistreatment for Riverside County and San Bernardino; and maintains an appointment to the L.A. County Superior Court Panel of Experts. “In the field, I see chronic compliant victims of mass marketing scams every month. These victims have often been involved in these scams for a year or longer. The scammers begin to implicate the victims in their illegal activity after about six months, maybe asking them to cash checks or mail packages (i.e., becoming ‘mules’). They require ‘total secrecy’ and use complex psychological tactics of manipulation. Unwinding these schemes is a process and can easily take six months to a year, and the victims need support during this time,” reflects Wood. Woods’ study began in early 2019 in collaboration with Purdue University, and Scripps student research assistants are working on the study alongside Wood throughout the spring semester and will continue their work at Purdue in Indiana over the summer. One such research assistant is Kaitlyn Zeichick ’20, a double major in computer science and cognitive science. As for Wood, the opportunity to both educate consumers and remove the shame of being an MMS victim has been a long time coming.